Who We Are - Jewish War Veterans of the U.S.A. Here at the Jewish War Veterans of the U.S.A. (JWV), we are proud to say that we are the longest running veterans service organization out there. We were founded in 1896 by a group of 63 Jewish veterans from the Civil War after a series of anti-Semitic comments about the lack of Jewish service in the Civil War. Since then, JWV has been working hard to be the voice of American Jewry in the veteran community. 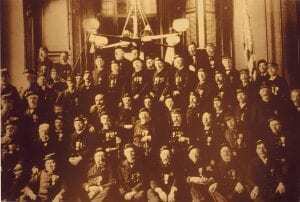 However, we have been up to much more than fighting against anti-Semitism since 1896. In World War I, we were essential to establishing the Jewish chaplaincy within the military. We also fought to include other grave markers in veterans’ cemeteries, such as the Star of David. 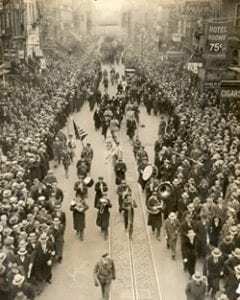 During the rise of the Third Reich, we led a huge protest march and boycott of Nazi Germany and their goods. We campaigned hard for the 1938 Foreign Agents Registration Act, which eventually led to Nazi leaders in America being deported from our great country. In World War II, we fought hard for the Jewish soldier, airman, sailor and marine. 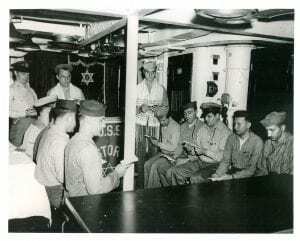 Jewish services were conducted on the battlefield in part due to the JWV SOS program, where Jewish communities were able to send packages to our troops. When our troops came home, we were there for them. 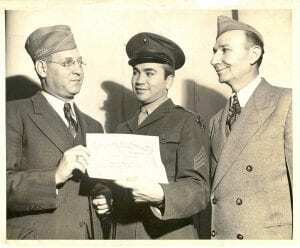 We campaigned hard to have religious and racial protections put into the 1944 GI Bill, which ended up allowing Jewish and other minority soldiers to use their GI benefits to lift themselves out of poverty. During the Cold War years, JWV fought the Ku Klux Klan and the John Birch Society. We fought hard for the rights of Jewish American soldiers during McCarthyism, when Jewish American troops were being accused or let go because of their Eastern European upbringing. We also spearheaded the National Conference on Soviet Jewry in the 1960s that eventually led to thousands of Soviet Jews being freed from the Eastern Bloc. In 1955, we established the National Museum of American Jewish Military History as a living testimony to Jewish American military service going all the way back to Asser Levy in the American colony of New Amsterdam. Since then, thousands have gone through the museum to learn more about our rich history and what major sacrifices Jewish Americans have made in the name of our democratic values. During the Vietnam War, JWV worked hard once again to create care packages for our Jewish heroes overseas. We also campaigned vigorously for the return of all prisoners of war (POWS) from this conflict. During the post-Vietnam era, JWV led a national protest after it was announced that the United States would close the Haifa USO. The decision was reversed in 1989, and the USO was kept open with the help of donations from JWV until its final closing in 2002. After the attacks on September 11th, JWV sprung into action yet again to continue to serve the Jewish American military community. They sent packages and served as lay leaders once again in the Jewish military community. We also were there when Jewish service members came home. Hundreds of JWV members attended funerals of fallen Jewish heroes during the wars in Iraq and Afghanistan. We also lobbied the U.S. Army to include the 18 gun salute at military funerals, which signifies “chai” the Jewish symbol for life. JWV fought hard for our members who did not receive the awards they deserved because of anti-Semitism. 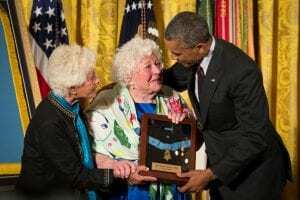 In 2002, the Leonard Kravitz Jewish War Veterans Act was passed thanks to the efforts of JWV, which resulted in 24 service members being awarded the Medal of Honor, who were intially passed over because of discrimination. 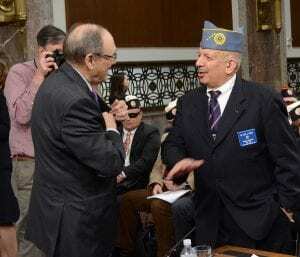 In the 2010s, JWV fought once again for the Medals of Honor for Tibor Rubin and for William Shemin. We also became involved in the national debate on sexual assault in the military, and continue to campaign for the Deborah Sampson Act, which guarantees the right for care to any female veteran. When Israeli Minister Tzipi Hotovely said that American Jews “never send their children to fight…serving as soldiers, going to the Marines, going to Afghanistan, or to Iraq,” JWV fought to correct this injustice that ultimately ended in an apology from Minister Hotovely. In addition, we continue to work with the Israeli government on ways to educate the Israeli public about Jewish American military service from the Revolutionary War to today’s wars in Iraq and Afghanistan. We will continue to fight for the Jewish Veteran as we have for over 120 years. We are the Jewish War Veterans of the U.S.A., and we are the Jewish Voice for Veterans and the Veteran’s Voice for Jews.